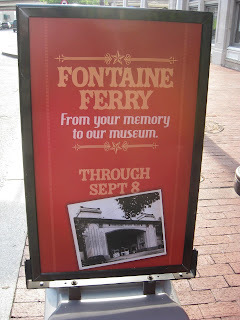 Last night Tim and I attended the preview party for the Fontaine Ferry Park exhibit opening today at the Frazier International History Museum. They offered typical "fair food" such as hot dogs, ice cream treats, funnel cakes, snow cones and of course cotton candy! Very cute! 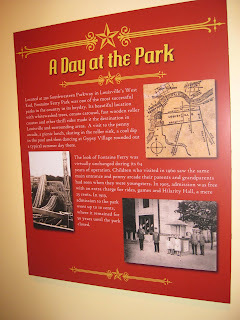 The exhibit itself was very well done and interactive with midway games, fun house mirrors and crafts for the kids! 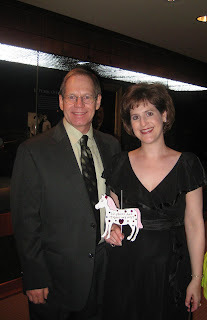 (I made a carousel horse complete with bling and a tribute to our meeting each other 10 years ago to the date!) Tim's Fontatine Ferry Park DVD's have been flying off the shelves in their gift shop and his ornaments are also for sale. A nice way to spend our "anniversary" together! Wow~ You look gorgeous! I love the shot of you next to the cotton candy...Black and Pink. After all, today is PINK SATURDAY! I hope you have a great week, in the Pink!